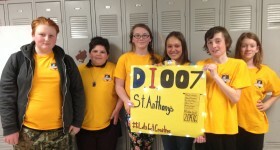 Students on the St. Anthony’s D.I.007 team (left to right) include: Aubrey Hughes, Liam Sullivan, Abigail Purchase, Mia Cochrane, Ethan Law and Anikka O’Neil will travel to Knoxville, TN, for the Destination Imagination Global Finals on May 19–23. A team of students from St. Anthony’s Catholic School in Chalk River will represent the RCCDSB at the Destination Imagination 2015 Global Finals, which are described as the world’s largest celebration of creativity. The Destination Imagination (DI) program involves teams of five to seven students who use science, engineering, improv, technology, performance or community outreach themes to tackle one of seven Team Challenges. “Teams must do the research and experimentation needed to solve every aspect of the Team Challenge and develop a performance-based presentation demonstrating the team’s solution…with no outside assistance,” says Doug Hunter, DI Regional Director, Eastern Ontario. Two teams from St. Anthony’s participated in the Improv Challenge of Destination Imagination at the regional tournament in Arnprior on March 7. “Our teams placed first and second, which qualified them to move on to the provincial tournament. With school board and parent support, both teams travelled to Toronto, where they placed second and third,” states Shelley Montgomery, Principal, St. Anthony’s. The second place team, named D.I.007 (who actually placed first province-wide in the Instant Challenge, which is worth 25% of the overall mark) qualified to move on to the Global Finals in Knoxville, Tennessee, May 19–23. These students demonstrate the 21st Century skills of collaboration, creativity, communication and critical thinking. It has been rewarding for team managers Montgomery and Karen Keels, St. Anthony’s Vice-Principal, to watch both teams grow these skills. “As managers, it was our job to explicitly facilitate self-reflection about these skills at the end of every Instant or Improv challenge practice. In the beginning, these teams did not always collaborate or communicate effectively but, as result of self-reflection and practice, it has been amazing to watch the growth,” notes Montgomery. While in Tennessee, students will meet and compete with teams from around the world. They will stay in ‘House Ontario’ while there. They will have the opportunity to make friends and share memories with a variety of students from across the province, country and world. The school board has been very supportive of the D.I.007 team. Parents and students have been raising funds and seeking corporate support to help offset the costs of the experience. Montgomery and Keels are also appreciative of the community support that has been received. “St. Anthony’s approached Canadian Nuclear Laboratories (CNL) about the concept of Destination Imagination more than three years ago, and we would like to thank them for believing in the program and for their ongoing support. So many other organizations have also generously supported us including Knights of Columbus, CWL, The Legion, Butler’s, and many more,” says Montgomery. Keels, who will be travelling to Tennessee with the students as Team Manager, says she is very proud of both St. Anthony’s teams who worked very hard to earn their placings at the regional and provincial competitions.